Scott walks back up Ramsay Street and says that he hopes Mike does better in the exams than he did talking to those two (Jane and Shane) That they weren't interested. Mike thanks him for trying and says that he hopes to talk to Jane before the exam. Scott doesn't think so as he saw Jane with Shane at Lassiters. Shane rides his motor bike up Ramsay Street into the Mangel drive with Jane on the back. Jane gets off the bike lays the flowers on the back of the motor bike and takes her helmet off and looks over at Mike. At that moment Nicky runs down the drive way to meet Mike in the street. Nicky apologises and says she thought she had lost her notes for a minute and they should go. Mike replies that there is something he wants to do first, something he has missed doing for a long time. He bends forward and kisses Nicky as Jane looks on. Nicky accuses Mike of only kissing her to make Jane jealous. Mike denies it but says “I thought you wanted to help” Nicky replies that she wants to help …yes but she won't be used and did he really mean that the kiss was something he wanted to do for a long time. Mike looks over at Jane; Nicky gets upset and tells Mike that he can sort out his own problem from now on. She walks off to go to her exam. Jane and Shane are looking on, Shane tells Jane not to get upset that it is exactly what Mike wants her to do. Jane denies she is upset she doesn't care; he can kiss whoever he likes. Shane replies that Mike is only trying to make her jealous. Jane shrugs and says that it didn't work. Charlene is reading a book as Shane walks past, and starts to question Shane about his relationship with Jane. Shane informs her that they need to get a couple of things straight. They are not an item, they are not going out together and they are not seeing one another. They are just good friends. Charlene is not convinced and wants to know why he is getting so annoyed about it all then. Shane replies that he is annoyed because everyone keeps going on about it and that if he wants to see Jane then he will and there is nothing Charlene or the rest of Ramsay street can do about it. Charlene looks at him knowingly and replies that he must like her a lot. Shane admits that he does, is that such a big deal? Why is everyone carrying on like he is some kind of monster with two heads who is going to slobber all over her. Charlene just replies that she just cares. Shane shrugs and tells her about Mike kissing Nicky in front of Jane to make her jealous. Charlene is shocked and says that maybe Jane should go out with him after all, but it is just that she isn't his usual type. Shane comments that maybe with his luck with women latterly maybe he should try something completely different. When they were lost in the bush, all they did was talk and it was great to be with someone who was honest and uncomplicated. Charlene changes her tune and says that now he has explained it, it all it makes sense and why doesn't he ask her out. Shane thinks that Auntie Madge would not be too keen, Charlene offers to talk to her but Shane asks her to keep out of it. Nicky comes into the kitchen obviously still upset, Scott tells her that he heard what Mike had done and for her not to take it so hard. Nicky replies that it is easy for Scott to say that but it really, really hurt. Scott says that Mike wouldn't have meant it. Sarcastically Nicky rebukes him by saying “Oh sure it was an accident, our lips just happened to collide and it was a complete coincidence that Jane just happened to be there watching” Scott tries to comfort Nicky by saying it was just a kiss. Nicky replies that Mike had told her that he wanted to kiss her. She gets more distressed and continues that deep down she had always thought there was a chance not a big one but a chance that they might get back together again. And when Mike put his arms around her and held her…then she realised it was all for Jane's benefit. Nicky chokes up and continues that every time she saw them together it hurt. She used to lie awake at night and pretend that it was really her that he wanted….she now knows that he doesn't want her. Getting more distressed Nicky says that she waited all that time for nothing. The tears start to flow as she says that no one wants her and no one ever will. Susan arrives and Clive goes and kisses her…and turns to Mike and tells him that he shouldn't be watching this as it is likely to get “R” rated at any second. Susan thanks Clive for picking Sam up from the nursery. Mike says that he should be going, Clive replies “hang on a moment Pal. You were about to tell me how old and decrepitated he was and how he didn't understand what it was like being in love” Susan stands there smiling at Clive. Whilst they cook dinner Charlene is pleading Shane's case with Madge about Jane by saying that everyone is being horrible about the pair of them. Madge disagrees and says that no one is being horrible with except maybe Mrs Mangel and Mike who have cause to be. Charlene accuses Madge that she was about to, Madge denies this but says that she is just a bit shocked that Shane is going to continue to go on seeing Jane. Shane had been listening at the door to Madge's final comments and tells Charlene that he told her not to interfere. Madge informs Shane that the easiest way to get Charlene to do something is to tell her not to. She continues that maybe he should hear how she feels about this. In the first place Jane is far too young and naïve for someone his age and that secondly he is taking advantage of her. Mrs Mangel arrives home and sees Jane standing in the living room holding the flowers. She makes a sarcastic comment that she didn't think Shane Ramsay was the flowers type. Jane tells her that she bought them for her and cooked dinner as well to say sorry, that she hadn't explained things very well. Mrs Mangel is not to be moved and says that Jane can not get around her that easily. There are no excuses for her behaviour or her lack of moral fibre. Jane wants to talk about it and tries to explain that when she was lost in the bush nothing had happened. Mrs Mangel snaps back “That is beside the point, you should never have put yourself in that position with a lout like Shane Ramsay in the first place” Jane defends Shane by saying that just because he rides a motor bike it doesn't make him a lout. Mrs Mangel spies the motor bike gloves which Shane has left behind on the couch and accuses him of previously being in the house. First Jane denies it and then says that he has been there but not as Mrs Mangel thinks. Mrs Mangel angrily tells Jane that she can have dinner by herself that she won't sit at the same table as her she is too ashamed. Mrs Mangel takes the gloves to have it out with Shane, Jane tries to stop her but Mrs Mangel will not be persuaded. Charlene, Madge and Shane are eating their dinner, while Charlene is still pleading Shane's case about Jane with Madge. Madge finally says that she has had enough of the conversation; she just wants to eat her dinner in peace. Shane mumbles his whole hearted approval. Mrs Mangel bangs loudly on the door and pushes Charlene aside as she opens it. She marches straight into the kitchen and angrily informs Shane that he should never dare to set foot in her house again or he will have the police onto him. Shane tries to defend himself by saying that Jane was upset but Mrs Mangel will not hear of it Shane is to stay away from her or else. Shane replies that Jane is old enough to make up her own mind. Mrs Mangel bites back that she is not and he is to keep his dirty hands off her. Madge has had enough, telling Mrs Mangel that if she must hurl abuse then she suggests that she goes somewhere else and does it. Mrs Mangel replies that so you support him do you, don't you know what has been going on? Madge defends Shane by saying that she knows him and she is sure he will do the right thing. Mrs Mangel is dismayed and asks Madge whether she has any principles. To which she replies “I am sure I have as many principles as you have Mrs Mangel, now if you don't mind I would like to get on with my dinner!” Mrs Mangel bites back that Madge hasn't heard the last of this. 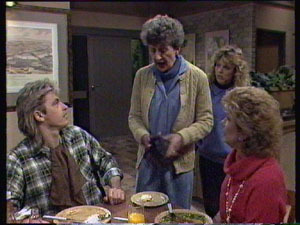 Madge loudly informs her “Perhaps not but would you please go” Mrs Mangel turns and angrily marches out of the house. Once Mrs Mangel has gone Charlene asks Madge “I thought you agreed with everything Mrs Mangel had said” Madge replies that she does but that doesn't mean that she has to listen to it. And she meant what she said she expects Shane to do the right thing. Mike sneaks in the back door as Nicky is doing the dishes helped by Lucy. Nicky turns to see Mike standing there who says he has come to say he is sorry. Nicky says that it doesn't matter. Lucy wants to know what he has done but Nicky sends her off to watch television. Nicky tells Mike that she isn't in the mood to talk but Mike insists that they have to. The phone rings in the background. Mike says that he meant it when he said that he had wished they had never broken up. Nicky replies that they have and that she is going away soon on the exchange programme so it would be stupid wouldn't it? But they agree to be friends. Mike tells her that she is too good for him anyway and Nicky lightly kisses him on the cheek. Susan is asking Clive if they can have a serious talk. Clive thinks it is a good idea they haven't had a serious talk for ages where would she like to start. And what with the world falling apart it is the least they could do to be a bit intense. So where do you want to start Afghanistan, the Middle East? 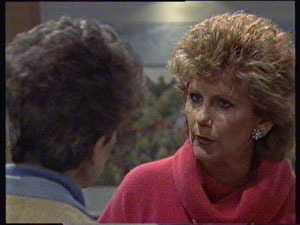 Susan suggests Ramsay Street but Clive thinks that is much too boring; how about the breeding grounds of the Goony bird. Susan says that they are going to have to talk sooner or later. Clive says they are talking as there is a knock on the door. Jane comes in as Clive answers the door and Jane asks Clive if he could have a talk to Nan. Clive wants to know what about. Jane replies that there is nothing wrong with a 17 yr old going out with a 22 yr old. Clive nods knowingly “Like Shane Ramsay” Clive thinks it will be a pretty tall order it might be easier to convince her to wear a mini skirt. Jane asks him if he agrees with her and Clive replies No, but to parents the difference between 17 and 22 is a lot bigger than the difference between 20 and 25. Jane thinks 5 years is 5 years and she doesn't see the difference, she cares about him that is all that matters. Susan says that is all very well following your heart but in the long run you have to look at things realistically. Clive replies that he doesn't know; “look at us”. Susan replies “Exactly” Finally Clive agrees to Jane's request to talk to Mrs Mangel and goes to see her. Clive returns and Susan asks how Mrs Mangel is. Clive tells her that she is the same as usual unfortunately…. poor old Jane he feels really sorry for her. Madge agrees she continues that she doesn't approve of Jane and Shane but the sooner they stop interfering the sooner things will work themselves out. Clive picks up Sam and realises that he needs a nappy change, Charlene offers to help. Clive says she can but she is not to look as Sam is very modest! As they leave Madge says to Susan that she is very lucky, Clive is very good with Sam. Susan looks very thoughtful and tells Madge that Clive loves her and she doesn't love him not in the same way. Madge asks if they have talked about it. Susan says she has tried but that Clive won't listen. Madge tells her that she is going to have to make Clive listen, Susan sadly agrees. The next morning Shane lightly taps on the door to be greeted by Jane, she tells him that he can come in her Nan left a minute ago. He whispers that he waited until he saw her go before coming over and wanted to check that she was Ok. Jane tells him that Mrs Mangel is barely talking to her. Shane continues to whisper that that must be a relief and then realises what he is doing and coughs and goes back to his normal voice. Jane apologises for last night and says that she tried to stop Mrs Mangel from going over to the Ramsay House. Shane says it is Ok he got his gloves back. Shane then asks Jane whether she would like to have lunch with him today and that he could pick her up after the exam. Jane readily agrees but suggests that they come back to the Mangel house for lunch. Shane thinks it is a bit risky, but Jane points out that it is safer than going out where someone might see them. The coffee shop is out as her Nan works for Lassiters. Shane agrees and tells her that wild horses wouldn't keep him away and he takes her hand and kisses it. Shane leaves and Jane closes the door, her face beaming at the prospect of her lunch date. Clive is having breakfast as Susan insists that they had to talk now. Rather flippantly Clive replies OK do you want more orange juice….toast! But Susan won't be put off…not even for toast. Susan takes a deep breath and tells Clive that she knows that he is in love with her; the trouble is that she doesn't feel the same way about him. He is a special person and a very wonderful person and if she could choose who to fall in love with he would be at the top of the list, but things don't work that way. Clive looks totally devastated by her words. Susan continues that she wishes it was different but it is not and that there is no point in pretending. Clive looks at her, picks up his orange juice and says Cheers; you finally got to say it and wants to know what happens now. Susan is unsure and Clive continues “You can never love me?” Susan says that she just doesn't know, she has asked herself that question so many times and she just doesn't know the answer. Maybe in time she could. Clive asks if Susan and Sam are going to move out and Susan replies “Do you want us to?” Clive shakes his head and says “No and if there is a chance that you might learn to love me, even it is a million to one then I want you to stay” Susan asks if he is sure Clive replies that he is and will she give it a go and see what happens. Susan replies that she is not promising anything but she is willing to give it a go. Clive says that is all he can ever ask and gently takes her hand and kisses it.